By Thoriq Firdaus in Web Design. Updated on October 26, 2017 . HTML is the standard language that forms a Web page, but it is not easy to extend or to maintain. We need another language as a layer that enables us to generate HTML dynamically. HTML Import is a new standard module that tries to make HTML more flexible. HTML Import allows us to include an HTML file into another HTML file. We can also access and reuse the content inside. This is an exciting new feature that may change the way we build HTML in (perhaps) the next decade. At the time of this writing, however, the HTML Import is still in the Working Draft stage and Chrome (v36 and above) is the only browser that supports it. Note however that this feature is disabled by deault. To enable HTML Import in Chrome, go to the chrome://flags page, enable the Enable HTML Imports option, then restart Chrome. Let’s start experimenting with HTML Import. Including an HTML template is similar to the way we include a stylesheet, we use the <link> tag. But instead of using rel=stylesheet, we add the link tag with rel=import. As an example, here I will include a template named template.html (I’ve added a few lines of dummy content to it). Now if you see the Web page through the Chrome DevTools under the Network tab, you can see that the browser (Chrome) loads the template.html. Keep in mind that the content in the file that is imported is not instantly appended to the main HTML file. When you see the main HTML file, you will see nothing at the moment. To begin, we select the template file with this code. This will select all the link tag with the rel=import. You may import multiple HTML files and want to select only a specific link tag, you may add id to the link tag and select it using the id instead of with the link[rel=import], as shown above. Once the file is selected, we need to select which content we will append to the main file. 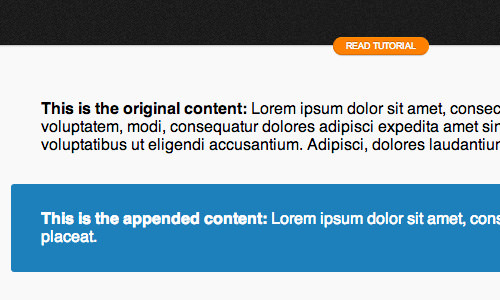 If you have the content wrapped with an id="content", you can select the content this way. The content should now appear in the main file. Contrary to how we append content, the stylesheet that we put in the imported file will affect the main content directly. Here we have style.css added in the template file, containing the following code that should change the paragraph color to red. The style immediately takes effect, as follows.